The most important tourist attraction of the city is the Great Pyramid with the Nuestra Señora de los Remedios sanctuary on top. At first glance, the pyramid looks like a hill as most of it is overgrown. The south side of the pyramid has been excavated and there is a network of tunnels inside. The pyramid and church receives about 220,000 visitors each year. From the top of the pyramid, in the sanctuary atrium, it is possible to see the Malinche, Popocatepetl, Iztaccíhuatl and Pico de Orizaba Volcanoes in the far eastern horizon. 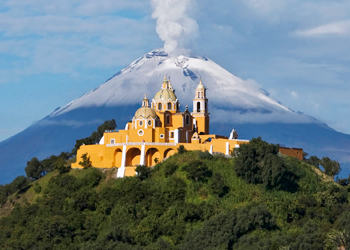 According to myth, the pyramid was built by a giant named Xelhua of adobe bricks, after he escaped a flood in the neighboring Valley of Mexico.The pyramid is small part of the archeological zone of Cholula, which is estimated at 154 hectares (380 acres). Building of the pyramid began in the pre Classic period and over time was built over six times to its final dimensions of 120 metres (390 ft) on each side at the base and eighteen meters tall. This base is four times the size of that of the Great Pyramid of Giza and is the largest pyramid base in the Americas. 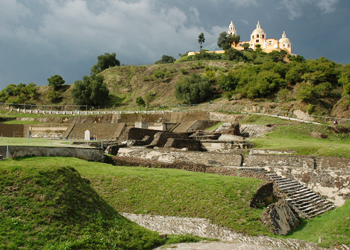 Two of the stages of construction use talud-tablero architecture which was also used in Teotihuacan . Some of the pyramid constructions have had burials, with skeletons found in various positions, with many offerings, especially ceramics. 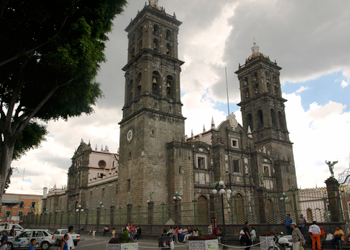 It is a colonial cathedral, and is the see of the Roman Catholic Archdiocese of Puebla de los Angeles. The cathedral’s bishop is Víctor Sánchez Espinosa. The cathedral is dedicated to the Immaculate Conception. On January 24, 1557 Viceroy Martín Enríquez (1562–80) authorized construction. The design was submitted to the Dean and Cathedral Chapter on November 11, 1557.Construction began in November of 1575, under the direction of architect Francisco Becerra and Juan de Cigorondo. Construction was finally finished in 1649.